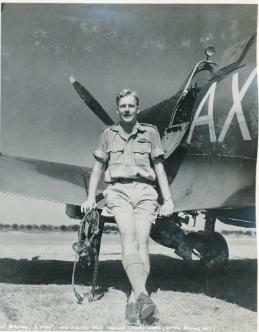 These photographs originate from the private albums of ww2 SAAF fighter pilot Hinton Brown. It was kindly made available to me by Chris Brown, Hinton’s son. I placed the photographs on this web site in order to share these gems to enthusiasts and the wider public as a gesture of homage to these brave men of past glory. Please respect the copy rights of these photographs and contact me to obtain the necessary permission if you want to duplicate some of this material in other web sites or printed matter. 12) Convoy; Doug on M.B.